My four-year-old has been really interested in astronauts lately and begged me to be one for Halloween this year. I’ve always make his costumes. From a fighter pilot to a steam train, it’s been fun to create his costume every year based on his interests, but I wasn’t quite sure I could pull this one off. After pricing some awesome astronaut costumes online and finding they were all well beyond our budget, I decided to make my own again. This year was also my 8-month-old’s first Halloween, so I wanted to involve him in the costume. With a $20 budget, duct tape, spray paint, Modge Podge, (a LOT of) hot glue, and some “Houston, we have a problem”-s along the way… MISSION ACCOMPLISHED! The helmet was made from a $7 candy cauldron purchased from Walmart. I used a grinder to cut the opening for the face and bolted a shield (made from mirrored scrapbook paper I had on hand) to the top. I printed NASA logos and used Modge Podge to adhere them to the helmet. I found the vest and boots at the thrift store in the girls’ section and covered them in white Duct tape. I used a white shirt he had to wear under the vest and covered a pair of old sweatpants in Duct tape as well. I used hot glue to add on scraps of plastic tubing (that is meant to be used for organizing electric wires) and caps as details, along with additional logos (using packing tape). The jetpack was made out of two water bottles and a fruit snack box assembled with hot glue. Then I spray painted it silver and added printed details. The flames are tissue paper. Instead of adding shoulder straps, I decided to hot glue the jetpack directly to the back of the vest. The wrist gauge and switches are pictures I printed, Modge-Podged to cardboard, and mounted to lids from a pill bottle and my season-all bottle. Then I cut slits in the sides and used zip ties to put them on. 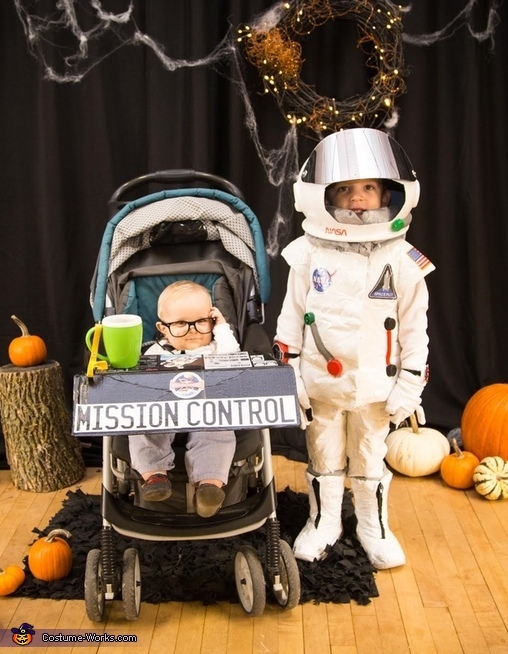 Mission Control was a diaper box cut to fit on the stroller spray-painted black covered with pictures (and if you look closely, my 4-year-old’s face is on the astronaut on the monitor screen. I painted the inside of a plastic mug brown to look like he was drinking coffee and used craft paint to make a tie and collar on his onesie. Assembly required two napping boys and burning nearly every fingerprint off my fingers with hot glue. It was painful, but well worth it!